I am an old Cold Warrior. I have served for almost 37 years in the military including tours or deployments on the intra-German border in the 1980s waiting for the Soviets to come pouring across the Fulda Gap, being on the Korean DMZ in 2001, and to complete the Commie Trifecta a bunch of time at Guantanamo Bay Cuba at the Northeast Gate. In those 37 years I have served under six Presidents and never did I believe until now that a President of the United States betray every longstanding ally and then to add insult to injury has very likely surrendered South Korea to the North Korean dictator with no conditions. It reminds me of how Neville Chamberlain sold out Czechoslovakia to Adolf Hitler in 1938. In 1938 Chamberlain was the supposed leader of the democracies and in order to curry favor with Hitler and to “bring peace to Europe” made a deal which surrendered Czechoslovakia to Hitler. As bad as that was and as horrific the consequences were for Europe and the world Chamberlain actually believed that his actions were required for peace. He believed that he could appease Hitler at the cost of a small multi-ethnic democracy, after all what did the Czech’s really matter? 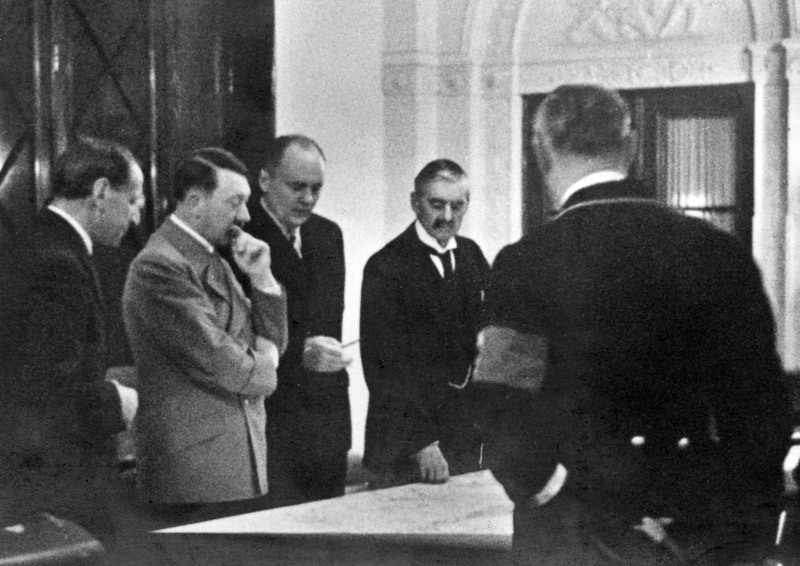 Chamberlain realized that his trust in Hitler and his word had been mistaken when Hitler overran the remainder of the Czech state just five months later. Having given up the only democracy in Eastern Europe which was also industrialized and militarily strong to the Nazis, Chamberlain went to war with Hitler over Poland, a authoritarian military dictatorship whose military and geographic position doomed her to the Nazi onslaught. Chamberlain finally did stand up to Hitler when it was too late. He was naive and in the case of Czechoslovakia he acted horribly, but he did recover some sense of honor by not appeasing Hitler in regard to Poland but by then it was too late and he has been forever remembered as an appeaser of Hitler. Unfortunately the current American President has made war much more likely because he has not only sacrificed military exercises that strengthen the American-South Korean alliance with no actual concessions by Kim Jung Un. His actions not only strengthen the North Korean dictator but also strengthen Kim’s allies, the Russians and the Chinese. 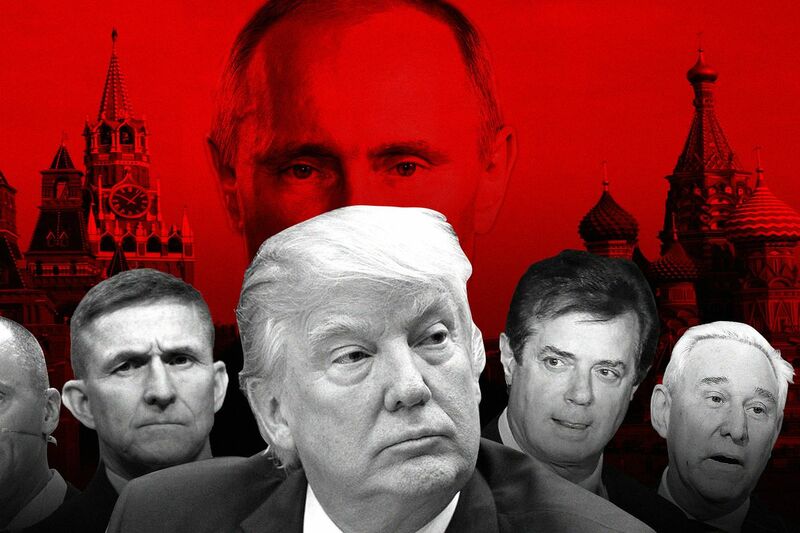 The Chinese have been actively working against the United States in the military and economic reams in Asia and Africa while Vladimir Putin’s Russia has actively pursued undermining democratic processes in the United States and Europe. When Donald Trump returns from Asia he will hold up a piece of paper signed by Kim Jung Un and claim that he has brought peace to the world. He may even get a Noble Prize for doing so, but in the end he will sacrifice allies and bring war to the world while making the United States weaker and more vulnerable to our enemies. His actions are not those of a patriot, but a Quisling. His followers will never admit that and like Hitler’s true believers they would much rather die with him in their bunker than admit that they were wrong in the first place. This is a dangerous time in history and the American Republic is in danger, our alliances which have been crafted with great skill since Franklin Roosevelt and Winston Churchill announced the Atlantic Charter, by Harry Truman, Dwight Eisenhower, John Kennedy, Lyndon Johnson, Richard Nixon, Gerald Ford, Jimmy Carter, Ronald Reagan, George H.W. Bush, Bill Clinton, George W. Bush, and Barak Obama over a period of 77 years have been shredded in less than a year and a half by President Trump. I want peace on the Korean Peninsula, I have served there and been on the DMZ. That being said I do not want that peace to come at the cost of the freedom of South Koreans. Likewise, the President has praised the murderous dictatorship of Kim Jung Un and given that dictator a legitimacy that he does not deserve for a minute. Less than two days before he destroyed the G7 Summit and undermined the nation’s who have stood beside the United States throughout the Cold War and then with diplomacy, economic, and military assistance stood with us when we were attacked on September 11th 2001 to the present day. On Tuesday the President endorsed Concentration camps, re-education centers, slave labor, and human rights violations by North Korea. Today he has claimed that North Korea no longer is a nuclear threat. His decision to end joint military exercises just happens to coincide with the public demands made for years by North Korea, Russia, and China. Do not expect for one moment that he will not do the same in this country, he has already started with immigrants. One should ask who will be next? 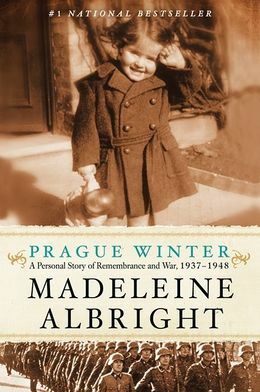 Prague Winter: A Personal Story of Remembrance and War 1937-1948, Harper Collins Books New York, 2012. Former Secretary of State Madeline Albright’s book Prague Spring provides an important look at the history of Czechoslovakia during the period between 1937 and 1948. It also provides the reader a succinct history of the Czech people and nation throughout the history of Europe going back to Charles IV (1316-1378) King Wenceslas, the pre-reformation martyr John Hus and revolutionary leader Jan Zizka. Albright is the daughter of one of Czechoslovakia’s most distinguished diplomats and advocates for Czech independence, democracy, religious and ethnic pluralism. Her father, Josef Korbel was raised during the latter years of Bohemia and Moravia’s subjugation under the rule of the Austro-Hungarian Empire. He would become a diplomat in the years just prior to the dismemberment and occupation of his homeland by Nazi Germany. Serving as a press-attache at the Czech embassy in Belgrade Yugoslavia he and his family, including his young daughter, the future Secretary of State were forced into exile in Britain. The book is a history written from the very personal perspective of a woman who when most of the events transpired was a child who experienced her first memories of life as an exile. She would not be able to return to her country of origin until after the fall of Soviet Union and the collapse of the Warsaw Pact. Masaryk would die shortly before the deal cut by the leaders of Britain, France, Italy and Germany at Munich to dismember Czechoslovakia in 1938. His successor, Edvard Benes would be left to deal with a situation where despite the strengths of his nation would be abandoned by the leaders of nations that he, and many of his countrymen felt abandoned by the world. That was the world that Madeline Albright came to age in. Albright would grow up to see her father working on behalf of Benes and the exiled Czech government during the war, and the post war struggles in the nation between Democrats of various parties against the Communist Party led by Klement Gottwald supported by the occupying Soviet Red Army. Her narrative provides a very effective and history of the period meshed with the experiences of her family, both in exile and those who remained. Her family, of Jewish origin, though largely secular and Czech in outlook faced deportation to the Theresienstadt Concentration camp and extermination camps and many died. While in England her parents converted to Catholicism and she was baptized into the Catholic Church. Her own story is fascinating, though remaining a Christian in the Episcopal Church she honors her family who died as Jews at the hand of the Nazis and her own countrymen. The book provides a badly needed narrative of a small but critical country which for much of the 20th Century was ground zero of the struggle between Democracy and Totalitarianism. It does not seek to make heroes of those that were not, but it does seek to understand the dilemmas faced by people whose existence is threatened by larger neighbors and how the experience of victimhood can lead to retribution and revenge. It points out the dangers of ideologues who have no other agenda but their own and the crushing of any opposition. Albright’s father, Josef would again have to go into exile following the Communist takeover of his country. His daughter, raised in that exile would go on to become an American citizen and rise to the pinnacle of the diplomatic world, as Ambassador to the United Nations and Secretary of State, the first woman to become Secretary of State. She touches on her own connections to her family’s Holocaust experiences in this book, though they are secondary to the history of Czechoslovakia before, during and after the Second World War and the work of her father in that critical period. 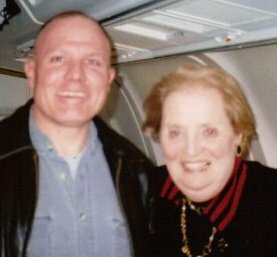 I have always admired Secretary Albright and has the honor of meeting her and conversing with her on a flight between Madrid and London in March of 2005. I was traveling in connection with a trip to visit my Marines in Spain, Bahrain and Scotland and she, accompanied by former Senator Gary Hart were traveling between Madrid and London for a security conference on the anniversary of the March 11th 2004 Islamic terrorist bombings in Madrid. She was a most gracious woman and interested in what I was doing. I will not forget that trip. In reading it I felt that I began to feel that I was beginning to know and understand men who were instrumental in history but always have been regulated to bit parts by American and British histories of the period. It is hard to imagine what those men placed in such and unenviable position had to endure, particularly the tragic story of Jan Masaryk, the son of Tomas Masaryk who would serve as foreign minister under Benes before and after the war and be murdered by the Communists shortly after the takeover. I think that the message that I took away from the book was the message penned by Secretary Albright’s father Josef in his unpublished novel: “The main thing is to remain oneself,under any circumstances…” I believe that in an age where political, racial and religious ideologues of various persuasions seek to divide the peoples of nations against each other it is an important work. What the Nazi leaders of the German minority in the country led by Konrad Henlein did was to divide and destroy a people who had lived in peaceful co-existence for centuries. Their actions led to the Nazi seizure and dismemberment of Czechoslovakia. Following the war 9/10ths of the pre-war German population of the country would be forced out by the Czechs and Slovaks now under the control of Soviet agents, something that occurred throughout Eastern Europe following the war. To remain oneself, under any circumstances. I highly recommend this book. Secretary Albright has written a fitting companion to the other histories of the period that fills a critical gap for American readers about the history of Czechoslovakia.